Our October Safety Day had beautiful weather, still waters, a great guest speaker and a good turnout by Suncoast Senior members. Sunshine Coast Council seniors promotion booklet featuring many members. Guest speaker is an honorary member of our seniors kayaking club although, believe it or not, he is a young 42 years old. He has been honoured with the title of which the club members are delighted. Set the pace, watching all the time for the slowest paddler’s pace. Incorporate the use of paddle & whistle signals as often as necessary. River crossing options could be to divide into two smaller groups, for safety. Authoritarian – controlling through verbal directions, do as I say approach. Democratic – guides through speech, role modelling and actions. Laissez faire – unclear instructions, easy going, anything will be ok. Suggested equipment members may like to consider when ocean kayaking. Not a full list but maybe a starter kit. Spare bungy cord (8-10mm) and rope. Throw rope (15m) flares, glow in the dark sticks ($12) coloured sea dye. Spare paddle and tools to repair, including a green garbage bag for lost hatches. Dry bags can be blown up and used as floatation ….. “to get out of trouble”. Always keep kayaking equipment in good order – check regularly. Baby nappy rash cream for chafing. Use stainless steel items where possible, to avoid rust. 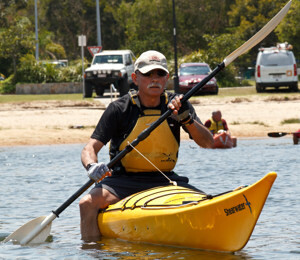 Role-playing, the different types of leadership styles, in kayaks and on the water. Which one are you? Swimmer deck rescue – legs in or out depending on stability. Hold onto paddler. Wet exist and ‘cowboy” re-entry …. along back deck. Sitting on kayak behind the cockpit, and paddle. Re-entry – move into cockpit then do the reverse to sit on back again (as above). Lying on the back of the kayak, paddle forward using only the hands.). Once again we enjoyed a beautiful lunch, so a big thank you to Jan from all those who attended and thank you to Barbara who was the only person who had a camera on the day ………… lots of great photos, soon to go on our web site! 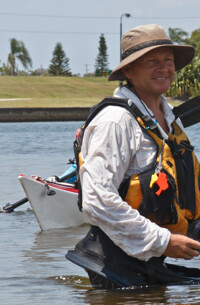 Thanks also to Gary Forest for his very informative talk and hands on water activities. 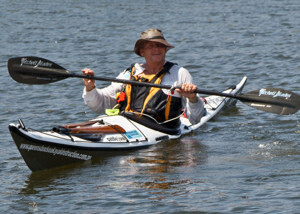 I have been told that several club members went out paddling the following Tuesday, up at Noosa, and did some more practicing of the skills learned during the week.